New York-based performing poet Copernicus talks about sub-atomic particles such as quark gluon plasma, which pertains to the building blocks of matter, and issues centered on the possibilities of an atomic New Orleans. As the press release states, the artist generally improvises upon themes and motifs. Copernicus' artistry and discography spans several decades, with Disappearance effectively transmitting his authoritative presence. With longtime musical director and instrumentalist Pierce Turner steering the current, the music is firmly entrenched within the progressive-rock realm, where man and science coalesce for a cunningly articulated program. 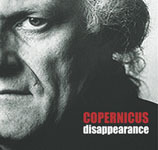 Copernicus prompts us to "bow...to the electron neutrino," spiced with plaintive cries and capricious musical textures. Interestingly enough, the instrumentalists mimic the leader's verse with a call-and-response methodology, in addition to providing background support. Copernicus undoubtedly means what he says due to his commanding delivery, that can instill either fear or humor. Hence, it's a nicely balanced string of events, amid quaintly organized subtleties and unanticipated shifts in musical architectures. The band sustains interest by morphing country-blues, English folk, and psychedelic rock into the equation. At times, Copernicus surfaces as an angry prophet. Despite asking if we're all afraid of God in concert with other inquisitive statements, it's not overly austere or cerebral. He generates food for thought with off-the-wall concepts, and topics of concern that many, perhaps, fail to contemplate. Ultimately, Copernicus feeds the mind's eye with a myriad of persuasive musings, although he seldom lets matters get out of control. In a roundabout way, he almost succeeds in convincing that life might be a sprawling farce, and that scientists' quest for the unanswerable could be a huge waste of time and energy. A compelling and altogether mind-bending voyage it is. Track Listing: 12 subatomic particles; The Quark Gluon Plasma; The Blind Zombies; Humanity created the illusion of itself; Atomic New Orleans; Poor Homo Sapiens; Revolution. Personnel: Pierce Turner: musical director, Hammond B3 organ, acoustic piano, vocals, percussion; Larry Kirwan: electric guitar, vocals; Mike Fazio: electric guitar; Bob Hoffnar: steel guitar; Raimundo Penaforte: violin, acoustic guitar, bandolin, percussion, vocals; Cesar Aragundi: electric and acoustic guitar; Fred Parcells: trombone; Rob Thomas: violin; Matty Fillou: tenor saxophone, percussion; Marvin Wright: bass guitar, electric guitar, percussion; George Rush: tuba, contrabass, bass guitar; Thomas Hamlin: drums, percussion; Mark Brotter: drums, percussion.